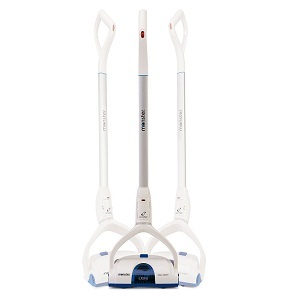 We tip off our hats towards this cordless sweeper that comes with an innovative Dual Motor Two Speed System technology. This is a motor that powers two separate brushes to rotate in opposite directions creating a highly efficient pick-up mechanism. It gives it not only unparallelled coverage power, but also makes way for deep-cleaning, which is the goal for its larger, bulkier relative, the vacuum. While it is able to maintain its efficiency at all times, the Monster sweeper weighs 5 pounds and might be a little too much for children or elderly people to handle. Buyers have also found it quite bulky, which means it might be difficult to operate in tight spaces and around and under the furniture. Storage might also be a problem, as the handle doesn’t fold and the handle loop doesn’t allow you to hang it on a wall. While your average electric sweeper has a single brush that spins in order to pick up the debris and throw it into the collecting cup, the Monster Dual Cordless Sweeper has two brushes that counterspin, doubling the power of the swipe, and improving the quality of your cleaning process. The 11-inch long base also contributes to fasten the process, and you can adjust the motors to run at two speed levels, so that you don’t waste any unnecessary energy when making the transition from carpet to bare floor. In addition, a swiveling base will give you freedom of movement, and the dual sided edge-cleaning feature will facilitate picking up all debris along the walls and other types of edges. Most vacuums and electric sweepers have you bend over to reach the on/off button, which, if you have a big house, will eventually get to your back, causing stiffness and pain. The Monster Dual comes with a fingertip control that’s placed on the upper part of the handle, allowing you to start it with just the push of your finger. Once filled, the large dust cup can be emptied with a single movement and using just one hand. This will keep you safe from the mess and fasten the cleaning. What’s more, both the brushes on this sweeper can be removed and cleaned separately, making it easier for you to put it back into function fast and safely. While this model is a tad heavy and occupies somewhat more space than your common sweeper, the larger amount of material ensures more stability, resistance to usage, and lessens the chances of the handle bending and the base cleaving at impact. In the same manner, the handle ends in a loop that not only makes for a better grip, but also is less prone to wear-related tearing. Overall, you are going to be able to use this sweeper, and preserve its efficiency for a longer period of time thanks to these features.